Beijing, April 10: Images of the upcoming OnePlus 7 smartphone have surfaced on Weibo, one of China's most popular social platforms, indicating that the smartphone is likely to be equipped with a curved OLED display. One of the leaked images indicated that the OnePlus 7 variant with model number "GM1915" would hit the market as OnePlus 7 Pro. Amazon’s Fab Phones Fest Sale 2019: Apple iPhone X, OnePlus 6T & Other Smartphones Will Attract Customers With Huge Discounts During the Sale. "The chin of the device is a bit thick whereas the other bezels are almost non-existent. 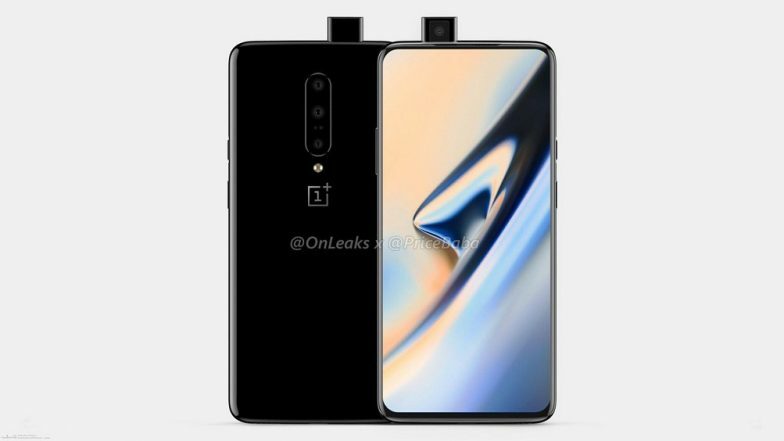 The case renders of the OnePlus 7 that have surfaced in the recent past have revealed that it will be arriving with a notch-less display and a pop-up selfie camera," the GizmoChina reported on Wednesday. OnePlus 6T Prices Slashed By 400 Yuan in China Ahead of OnePlus 7 Launch. The supposed OnePlus 7 Pro's notch-less display would be dubbed as Super Optic screen. The size of the display would be a 6.67-inch and it is expected to carry support for full HD+ resolution. A Qualcomm Snapdragon 855 chipset would be present along with 8GB RAM.